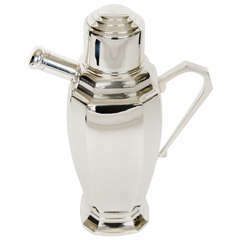 A wonderful and most unusual cocktail mixer, less of a shaker and looking rather like a coffee pot or cafetiere. Made by the well renowned silversmith, James Dixon and Sons and fully marked on the underside. Marked Made in England and 1 pint. The knob on the top is used to move the shaft up and down mixing the ingredients inside. Something different for the bar, made from silverplate and dating to circa 1920. I have had one of these in the past but not one finished with engine turned decoration. Excellent condition, the base diameter measuring 3 3/4"; spanning 6" from spout to handle and standing 8 1/2" tall. Item ID: 40758. Estate English Art Deco "Gaskell & Chambers" silver plate cocktail shaker, circa 1930-1940.